The AAA Four Diamond Award-Winning Harrah’s Hotel is located in the heart of the world’s most exhilarating city. This 26-story marvel, with 450 oversized luxurious rooms and suites, provides an unparalleled escape. Rooms feature deluxe beds with Simmons® Beautyrest® pillow-top mattress, high-definition flat screen televisions and wireless internet. 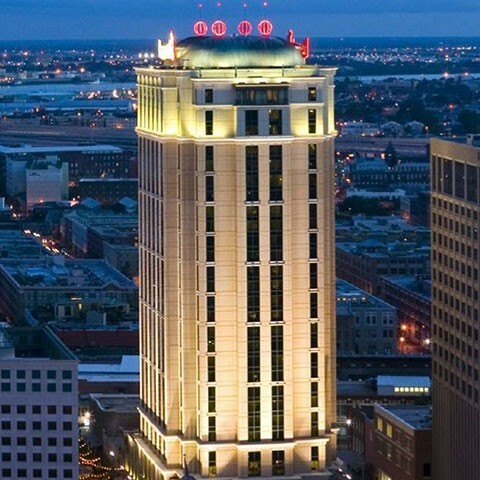 With the spectacular views of the Mississippi River, New Orleans’ skyline and just steps from the French Quarter, Convention Center and a few blocks from the Superdome, there is no better place to stay in New Orleans than Harrah’s New Orleans luxury hotel. Experience a fun, friendly casino atmosphere at Harrah’s New Orleans one that removes you from the ordinary, with helpful dealers and attentive servers who ensure your total comfort. New and old friends cheer you on as you hit your lucky streak when you’re at Harrah’s New Orleans. So choose your favorite casino table game and let the good times roll! If you love slots, you’ve come to the right place! At Harrah’s New Orleans Casino, we have over 1,700 of the city’s most exciting slot machines spread across a 115,000 sq. ft. gaming floor. A wide variety of your favorite games including progressive slots and video poker makes Harrah’s payout paradise! Love penny slots? We’ve got 700 of the hottest one- and two-cent games for you to choose from in our high-energy Penny Gras slot section. You can also try your luck at one many ultra-high limit slot machines in the Court of Good Fortune where payoffs are big. Don’t forget to stop by Smuggler’s Court, Party Gras and Mardi Gras Court where the fun and action continues.